IMAGE: Mohammad Kaif celebrates a century in the second Test against the West Indies in St Lucia, June 2006. 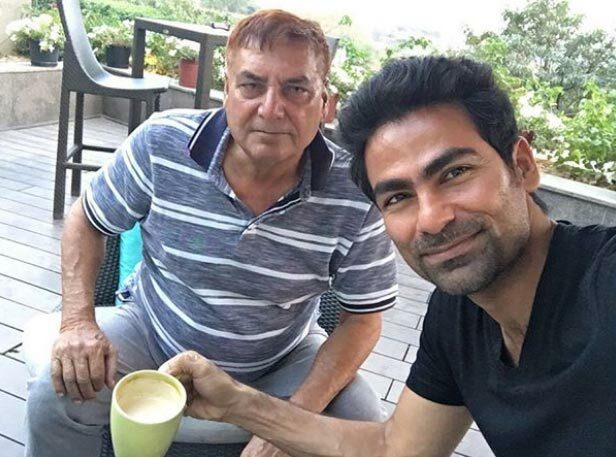 His father Tarif and elder brother Saif played first class cricket and it came as no surprise when Mohammad Kaif decided to follow in their footsteps. Born in Allahabad, Kaif, aged just 11, made a major life-changing decision to shift to a Kanpur hostel which is now known for producing cricketers like Praveen Kumar, Suresh Raina and R P Singh, to pursue his cricketing dreams. Although life was not smooth sailing at the hostel when he started off, it did help him working on his cricketing skills, especially fielding, and the tough conditions toughened him mentally. He rapidly made strides in age group cricket in UP and was regarded as a good leader, captaining the UP Under-16 team. There was no stopping young Kaif who led India to the Under-19 World Cup title in 2000. A couple of months later, he made his Test debut against South Africa in Bengaluru. Even though he failed to make an impact in Test circket, which he puts down to lack of opportunities and the presence of top class players like Rahul Dravid, Sachin Tendulkar, Sourav Ganguly and V V S Laxman, Kaif was a vital cog in India's ODI set-up from 2002 to 2006. Kaif last played for India in 2006, but continued playing domestic cricket, eventually featuring in 186 first class games, finishing with more than 10,000 runs. As much as he was known for his finishing abilities with the bat in his heyday, it was his brilliance in the field which made Kaif stand out among the cricketers of his era. Kaif took great pride in his fielding and in an era when sloppy fielding was the norm, he was a sterling exception. Then captain Sourav Ganguly and coach John Wright cited Kaif as the role model to inspire the other Indian players and improve their fielding. On July 13, Kaif, now 37, finally bid farewell to the playing fields. 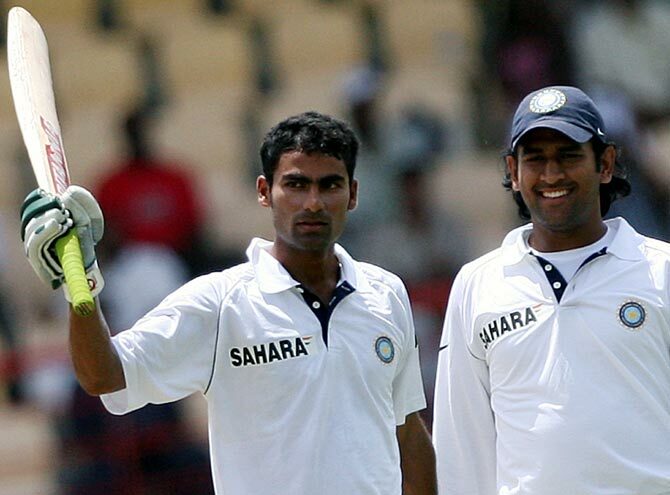 "I scored a century in my last Test series, 148 not out against the West Indies in 2006, but I was not selected for the next series," Mohammad Kaif reminds Rediff.com's Harish Kotian. Would you say that you played in one of the finest eras of Indian cricket featuring greats like Tendulkar, Ganguly, Kumble, Dravid, Laxman and Sehwag among others? How difficult was it breaking into the team and then to retain your spot? That was one of the reasons I never had a long Test career. I made my debut in 2000 against South Africa. I played for six years after that, but I only managed 13 Tests during that time. I was dropped a few times. I scored 91 in one match, but was dropped for the next game. I scored a century in my last Test series, 148 not out against the West Indies in 2006, but I was not selected for the next series. That is because I played in an era where we had so many good players -- Sachin Tendulkar, Rahul Dravid, V V S Laxman, Virender Sehwag, Sourav Ganguly. Even Yuvraj Singh played a few games in between. So I didn't get the chances. I had no choice, but to wait for my turn. Sometimes you are in form, you are scoring runs and feeling good about your game, and you want more to play more matches, but you don't get that chance to climb the ladder and take your career to the next level. The reason I didn't have a long successful Test career because there were so many good players around during my time. At the same time I didn't get many chances to prove myself, so it was a combination of both. You worked hard on your game and scored a lot of runs at the domestic level to force your selection back into the Indian team. Would you say you were not given enough chances or a long enough run especially in 2006? Anil Kumble in 2012 had called for your inclusion in the Test team after Rahul Dravid's retirement. Would you say you were dealt unfairly by the selectors when it came to Test cricket? I would say I am happy with my career overall and I have no regrets. You can say my career had more quality than quantity. It's like sometimes you go to a top restaurant and order a dish, the food quantity might be less, but if the quality and taste is good, then it leaves a mark forever. As far as my career is concerned, I think I delivered quality. I could field well and save runs, and I scored runs whenever needed. That is very satisfying because I last played for India in 2006, but even today when people meet me they still remember that 2002 final victory at Lord's, they still remember Kaif as the best fielder who could take some amazing catches, get run outs and save runs on the field. Fielding was your forte, you were the torchbearer for India's improvement as a fielding unit in the last decade. Back then, did fielding give you an extra edge in an era when diving to stop a ball or sliding was not so common, at least in Indian cricket? You heard the Hindi saying 'Ek Anar, Sau Bimar' so that is what was happening then. John Wright, who was the Indian coach, was trying to make India a good fielding team. And that was also the motivation for me because everybody was good either in batting or bowling, but no one was known for his fielding. Wright highlighted the contributions made by good fielders. So, me and Yuvraj were able to seize the opportunity and push for our selections with our fielding. You played most of your cricket for India under Sourav Ganguly who backed you a lot. How was he as a captain? No matter how good a player you are, you need to have backing else you will get nervous. When things are not going your way, you will get lost. When Ganguly was the captain and John Wright the coach, they gave extra attention to fielding. Ganguly believed in me. He believed that Mohammad Kaif will bat at No 7, he will score 40 runs, he will save 30 runs on the field, so he is contributing around 70 runs in every game. Ganguly knew the importance of my role in the team and that was very important. He always used to come and encourage me and never put me under any pressure. He used to tell me 'If you play 40 balls, give me 40 runs and save me 30 runs in the field, that is your job'. He never put me under pressure by asking me to hit sixes or score runs quickly. I always played for the team and tried to fulfil the role that my captain gave me. I was happy that I was able to repay his trust. How did your cricketing journey start? For someone, whose father and brother both represented the state in domestic cricket was it a natural choice for you to take up cricket? Yes, it was a natural choice for me to take up cricket. My father was a Ranji Trophy player, he played around 60 first class games for the Railways and Uttar Pradesh. Playing the Ranji Trophy was an achievement in those days for someone coming from a small city like Allahabad. There was a cricketing environment in the family from the very start. That helped me because I learnt a lot talking to my father, his friends who used to come home and discuss about cricket. My elder brother Saif also played cricket. I used to watch his club matches in Allahabad. I played club matches in Allahabad, then I shifted to the hostel in Kanpur at the age of 11 to learn cricket. That is where the journey started for me. Was it tough moving to a hostel leaving your family behind at such a young age to pursue your cricketing dreams? It was very tough. But I am happy that I left home and went to stay in the hostel because I learnt so many things, to be independent, to take my own decisions. I also became mentally strong because there was so much competition. There were so many Ranji players in the hostel, there were so many Under-19 players, so my aim was to do better than them so I could stand out and get noticed. I had certain goals to achieve and even though I faced some tough times from the seniors, I never gave up. You faced ragging at the hostel? Yes, I faced some ragging early on. I was given tasks like rolling the pitch with the big roller under the hot sun, shave the grass, putting up nets, removing the nets, getting the ball back when others were practicing in the nets. The canteen at the hostel had a fixed menu. I was given the task of going to the market to get things like rice, wheat flour, pulses, vegetables and other daily requirement for the canteen. I also laid out the plates for dinner, served food and many other things, but I learnt a lot of things from that experience. The first two years were tough because I was missing my family and I was doing all these tasks. But that was the culture in the hostel. If you were a junior player, that is how you started. That helped me a lot because mentally it made me stronger. I also worked a lot on my fitness and fielding during my time at the hostel. You paved the way for a lot of UP cricketers to make it to the Indian team. How tough was it starting from a place like Allahabad which was not known for cricket back then? A leader needs to have a vision and then he needs to act on the vision. As a captain it depends on the kind of players you have and how you want to utilise them. You need to understand the players, support them, back them during tough times. First the skill comes, then the tactics and that is what makes a good leader. I had all those qualities at a young age. My first brush with captaincy was with the UP Under-16 team, then I captained India to the Under-19 World Cup title in 2000, where I led a team including players like Yuvraj and Ajay Ratra. That started my journey as a captain and that triumph helped me a lot when I took over as UP captain in the Ranji Trophy. Praveen Kumar, Bhuvneshwar Kumar, R P Singh, Suresh Raina, Piyush Chawla, they all made their first class debuts under me. They used to look up to me. Being a senior player and having played for India, whatever I learnt from players like Dravid, Tendulkar, Ganguly and other I was sharing that experience with the young UP players. Overall, I was a good fielder so I had a good idea of the angles. I played a lot of chess growing up and that helped me with my field placings. I never believed in conventional field placements, I rarely used it and that helped me a lot and my team because the opposition would be left surprised with our tactics. Beating Mumbai at home in the Ranji Trophy under my captaincy gave the team the belief. People started taking notice of the UP team because beating Mumbai in the Ranji Trophy is like making a statement of intent. We then beat Bengal in the final to win the Ranji Trophy for the first time. We had a young team that time including Praveen, Raina, Chawla, but they gelled well with the seniors including Gyanendra Pandey, Rizwan Shamshad and Ashish Zaidi. The most important thing was that we played as a team. I tried to change the cricketing culture in UP by bridging the gap between the seniors and young players. We had a lot of meeting and chats and that made a huge difference because the whole squad got united and worked towards just one goal. You scored more than 10,000 runs in domestic cricket and played for quite a few teams. After a long career with UP, you turned out as a professional for Andhra and Chhattisgarh. What are your views on India's domestic cricket? There has been a huge change in the Indian domestic cricket in the last few years. I must congratulate the BCCI because our domestic players have taken their game to the next level. The big positive for India is that someone like a Rahul Dravid wants to help the junior cricketers which can be beneficial in the long run. When we won the Under-19 World Cup in 2000, I remember only the final was shown on TV. But now they show all the matches, the players get more match practice by going on tours like Under-19 or with India 'A', so they get to play in different conditions and against different opposition. We straightaway went to play the World Cup, but now they get exposed to a lot of different conditions early in their career. The IPL has also made a difference because youngsters get to learn from it. Overall, the BCCI deserves a lot of credit for the improvement in the domestic structure. The infrastructure has improved so much. In addition to the NCA (National Cricket Academy), we now have zonal academies. Now that you have retired from all forms of cricket, in what role will we see you in the future? My long term goal is to do coaching. I have spent around 20 years on the cricket field, so whatever I have learnt I want to pass it on to the next generation. Right now I am doing a bit of commentary, some work in the corporate sector like giving talks, and also some media work. I have plans to coach, but right now my family is young so I will wait. If something concrete comes my way I will think about it. You contested the 2014 Lok Sabha election on a Congress ticket. Do we see you contesting the next Lok Sabha election?